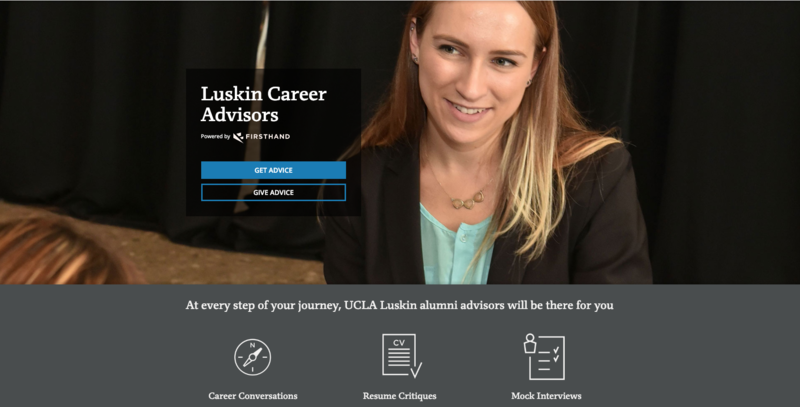 What is the Luskin Career Advisors Network? The Career Advisors Network helps students connect with UCLA Luskin alumni and professionals in their fields of interest. Our alumni want to help guide your career and give you tips to secure internships and consider career positions. Create a profile and get matched with alumni who share your interests. Sign up for different consultations, watch free webinars and talk to alumni who want to talk to you! Can alumni get advice too? Yes! Current alumni can reach out to seasoned professionals who can answer questions such as how to move up from your current position or discuss trends in your career field. Just ask! Alums may be asked about the job search process, resume critiques, mock interviews, mentoring and more. Great for building your alumni network. Log in to the Luskin Career Advisors Network.